In my July Newsletter, I did a wrap-up of the year so far and concluded that the market, for the moment at least, seems to be going sideways. Post Labor-Day inventory has already shown a big jump in anticipation of the short buy/sell season between now and the end of November. It’s too soon to say whether the new inventory will excite buyers to loosen their wallets or simply cause them to be pickier. 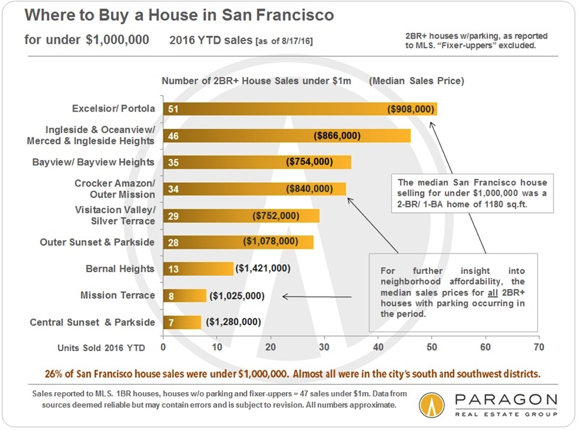 So with the market on “pause,” I thought I’d put together a grab bag of charts that cover SF housing affordability, both from the standpoint of owning and renting. 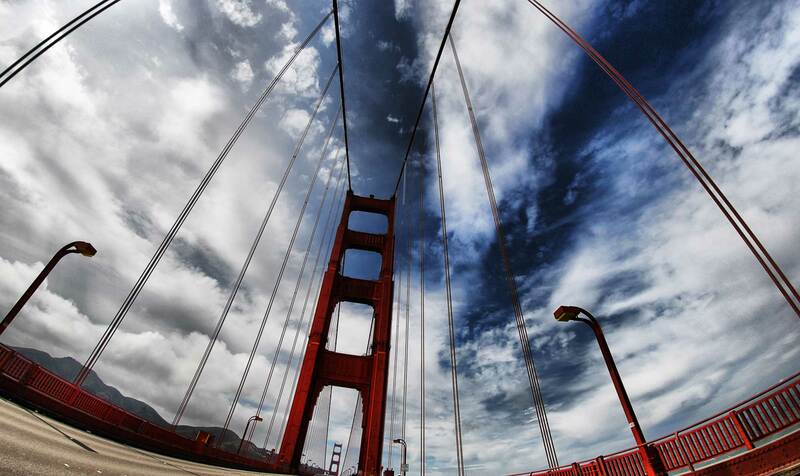 Many view housing affordability as a central concern for San Francisco’s long-term future. Changes in the rental market often reflect or foretell changes in the ownership market, and vice versa. 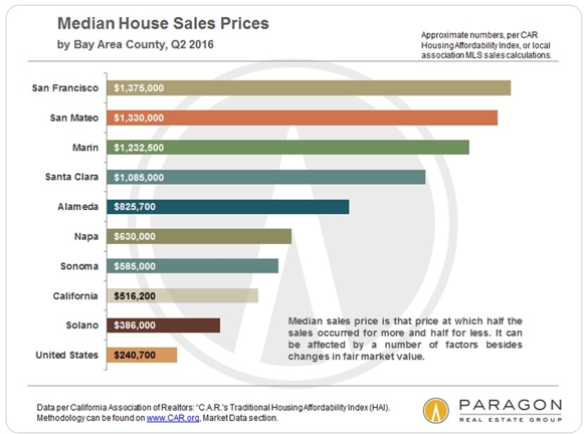 Looking at San Francisco’s metrics in comparison to other Bay Area counties adds perspective. I’ve collected the following charts from two of Paragon’s recent newsletters. (You can find the full versions here and here.) For the most part, the charts speak for themselves, but the one below really needs some explanation. “Affordable Housing” in San Francisco. This fascinating graphic, which I’ve highlighted to make more readable, is based on SF Controller’s Office estimates from late 2013. It breaks down the housing supply by rental and ownership units, and further divides rental by those under rent control. The first thing that stands out is that of San Francisco’s (then) 237,000 rental units, nearly 75% are subject to rent control. Why so many? 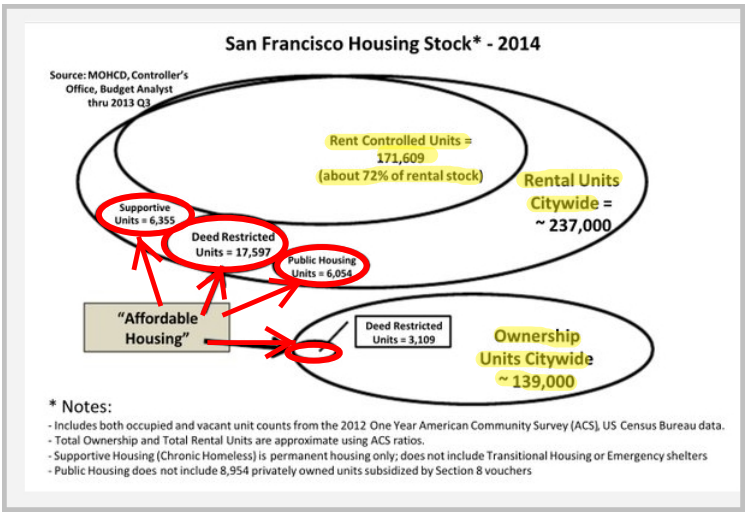 Because SF’s Rent Stabilization Ordinance primarily governs multi-unit homes built prior to June 1979 – ie. the vast majority of SF’s multi-unit housing. In fact, if the chart were only to reflect multi-unit housing and not include individual condos and homes that are rented out by their owners and, under state law, are exempt from rent control, the percentage subject to rent control would be significantly higher – perhaps as much as 90%. True, rent-controlled units do adjust to market rental rates when tenants leave, but the sheer number of units subject to the ordinance helps explain why rent control legislation is a perennial political issue in the city – and one usually decided in favor of tenant advocate groups. As for the units identified as “affordable,” when adjusted for recent construction, they comprise just 34,500 out of the city’s roughly 382,500 units. That’s a little over 9%. 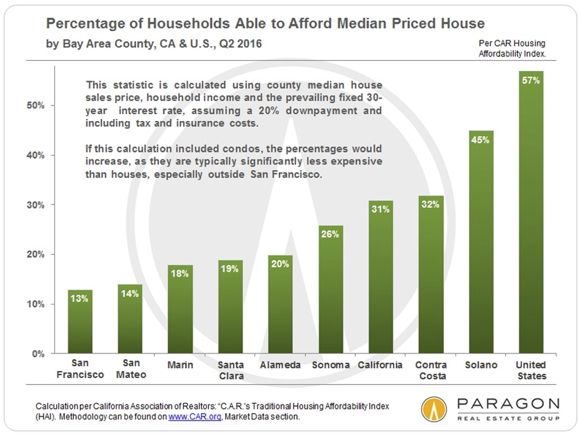 Even with thousands of new affordable housing units in San Francisco’s long term new construction pipeline, it’s generally agreed that they will never come close to meeting the need. 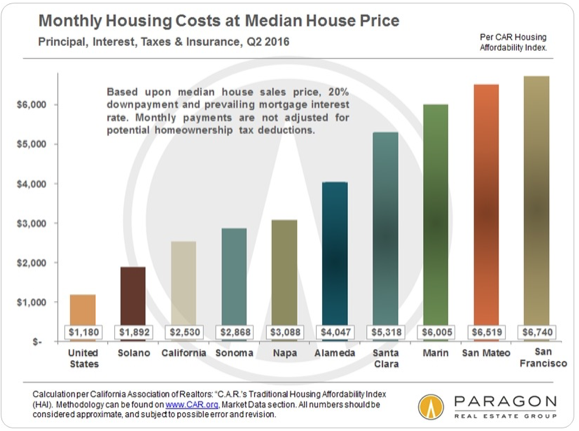 And what does “affordable” mean in a city where the median home price is five times the national median? See the charts below. 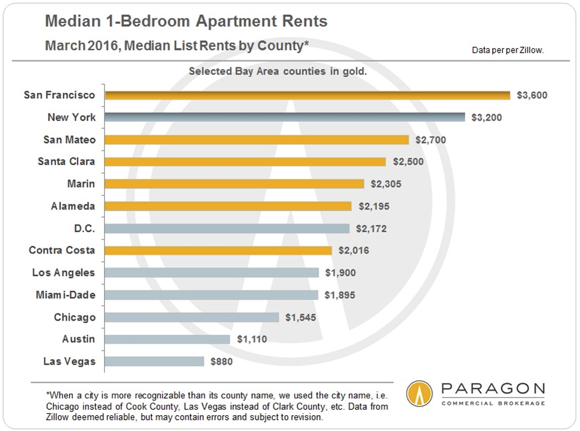 Bay Area Rents. 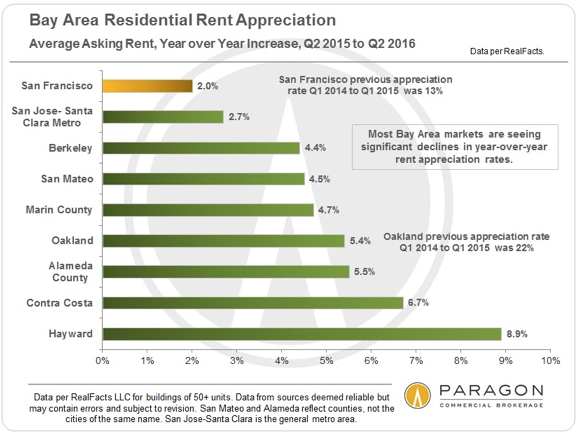 Meanwhile, rents, while still very high, seem to be plateauing. 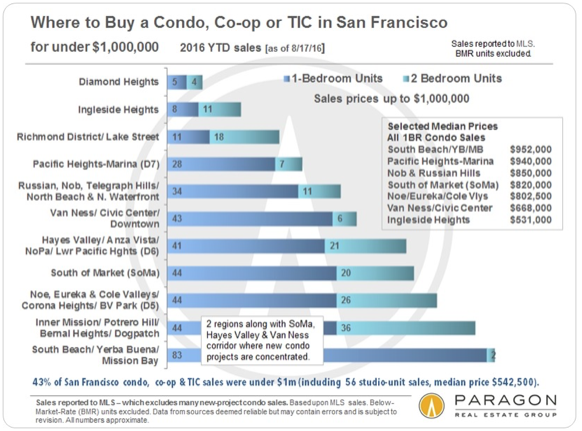 The same thing is already happening to SF condo prices, especially at the high end. 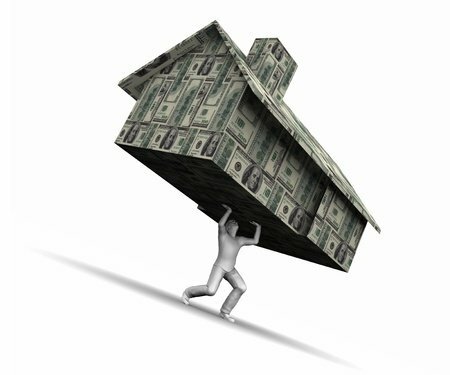 Home prices may end up following a similar pattern. 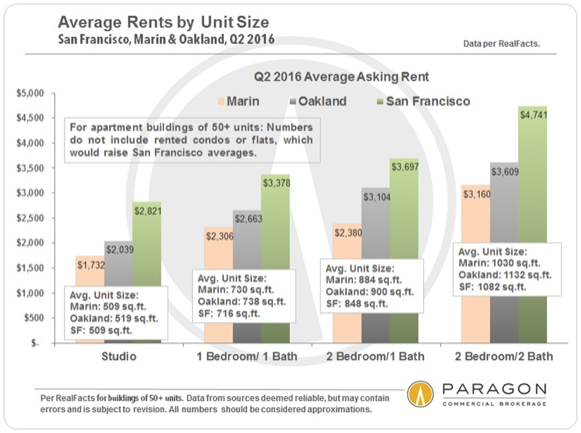 Note that the rental rates in the above charts are based on large buildings of 50+ units. I’d guess that smaller buildings or individual condo rentals would generally rent for more. 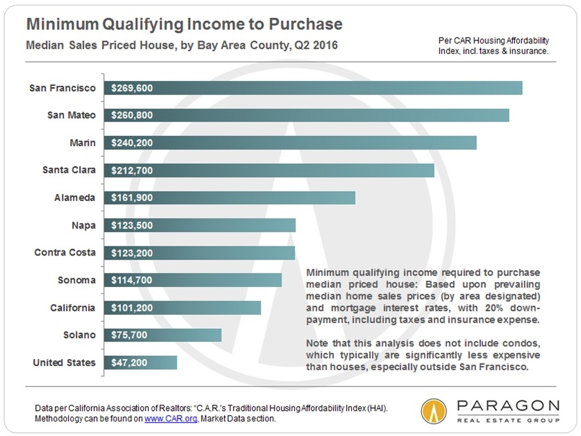 San Francisco’s “Affordable” Neighborhoods. The following charts show the neighborhoods where most house and condo sales are occurring for under $1 million. 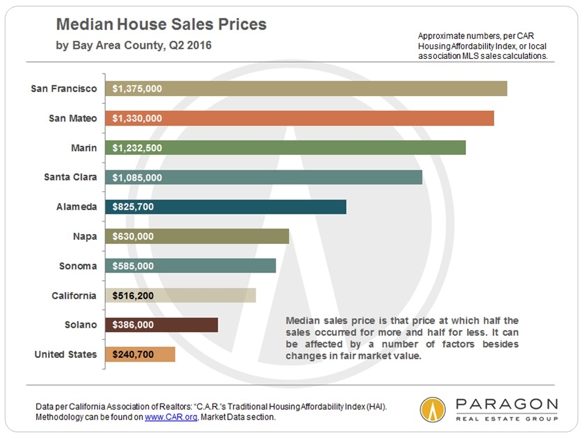 We have tons of additional charts that show neighborhood sales activity at other price points as well. You can find them here, or just call or send an email and I’ll send you what you need.